I’m reading a book called “What We Leave Behind” by Derrick Jensen and Aric McBay. It is depressing as hell. It explains how people are murdering the earth, which we absolutely are, but hasn’t offered any solutions thus far. I’m only part-way through the book and am hoping there will be some concrete suggestions that help me feel as though I can do something. Being left in a hopeless morass by a book is no way to save the environment. In fact, if we feel hopeless, we’ll sink into apathy and won’t do anything. Aside from getting corporations out of running our government and stopping their earth-ravaging ways, I would like to see efforts made by manufacturers to build reclamation into every product they create. Like Patagonia, the clothing company that takes back its used clothing for recycling. However, we have to wean ourselves off plastics because even items like polar fleece jackets shed bits of plastic that end up in our food chain. We need some bright engineers and biochemists to figure out how to safely break plastics down into their inert constituent elements once we are finished with them. In the meantime, in order to reduce our use of plastics, we need products made of alternative natural substances. You know, good ol’ fashioned glass and paper and wood. If there are alternatives out there, I try my best to use them. I’m pleased to have found bamboo toothbrushes available at Fresh Thyme and I bought one each for Hubby and me yesterday. They cost a little more than plastic toothbrushes, but not much. They were only $3.49 each. Erik and I are not the sort to replace our toothbrushes every 6 months, or whatever time frame dentists recommend. Instead, we clean our toothbrushes with hydrogen peroxide periodically and keep using them for a year or two. We don’t want to put these plastic sticks into a landfill. In fact, I have a baggie full of used toothbrushes that we can continue using to clean other things. But, now that we have bamboo toothbrushes, I will feel less guilty about getting rid of them. 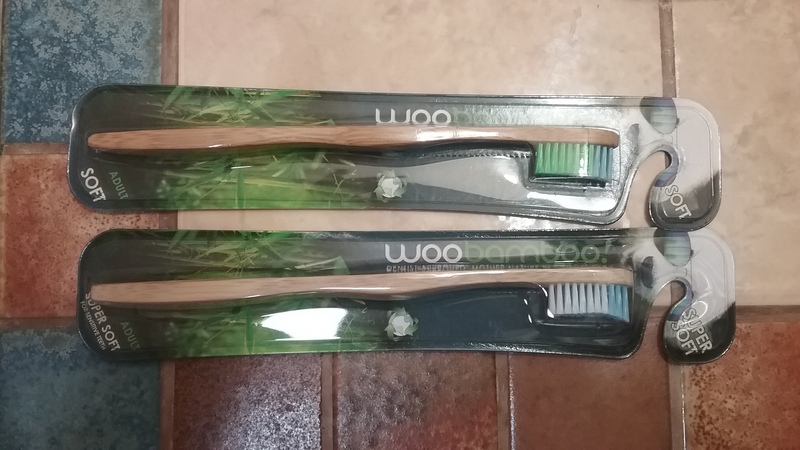 WooBamboo toothbrushes from Fresh Thyme. April 2017.